Genopro 2016 (3.0.1.3.) is not correctly scaling for high dpi displays. On my WQHD notebook, fonts and toolbars are so small that the program becomes virtually unusable. If you press the + key this will enlarge fonts. Does that answer or do you end up with too much space between icons? The + key just zooms into the map, like the mouse wheel. This all works well, the problem is the GUI itself, particularly the toolbars which are so small that I can't use them. 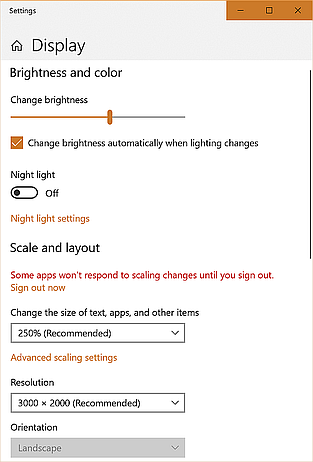 Use Windows Display settings to control the scaling of text and icons, e.g. use recommended settings. This works fine for me on a 3000 x 2000 resolution screen where Windows recommnds 250% scaling, but I usually set it to 225%. I do this of course. It works well with almost all programs, with a very few exceptions. GenoPro is one of them. I'm on Windows 7 though. Ok. With Windows 10 GenoPro is fine but at present the GenoProX Alpha sample is not, but this can be worked around by changing dpi scaling method in the compatibility settings under the Windows property dialogue for the program. I guess you have your reasons for staying with Windows 7 and have investigated the several other web discussions about the application dpi issues with Windows 7. For some reason in W7 it doesn't work with certain programs, and the compatibility settings don't help. But of course I understand that GenoPro is more worried about supporting up-to-date operating systems.